I hereby announce another Stephen King Readalong, this time it is MISERY, in the merry month of June. Because, in supporting the search for the scariest book of King’s repertoire, I recall that the bits in IT that scared me the most were Bev’s real life hell. So it is with this in mind that I decide that Misery, with its setting of ‘real life’ and no woo-woo heebie-jeebie supernatural elements – I’m supposing here – I suspect that Misery will be the one that scares me the most. Truthfully, I am not into the search as much as Jill. I really am not sure why I selected this book but I’m keeping whatever promise it was that I would read Misery in June and I now invite you all to join me. Informal, using Twitter hashtag #MiseryRAL, a June beginning post with comment sign-up and a June ending post with review/summation. Sound reasonable? I have not seen the movie but I do know which actors play the parts of author and fan. Sign me up! I am also downloading it for audio as well. I like my King listen-alongs. I’m in too! This is definitely my year of catching up on King’s novels. I’ve also got Under the Dome, Bag of Bones and Lisey’s Story in my sights. 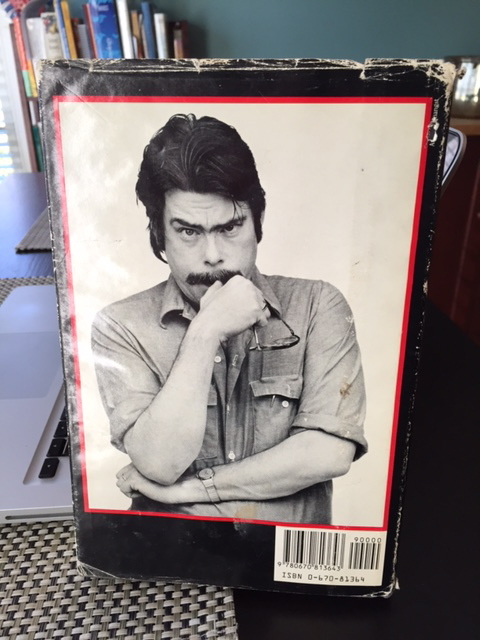 That might be my favorite author photo of Stephen King. I love it. Haha! IN! And I totally busted out laughing at that picture. It is hilarious. This is one of my favorite King novels and it’s been years since I’ve read it. If anyone can join in I’d love to read – or in my case likely listen – along. Absolutely! join in! Everyone is invited. I’m in! I found the book with that same scary author photo! I think I’ll join in, and I think I’ll do audio, as I love SK in audio!!! I do, too! My favorite is IT – Steven Weber as narrator is FANTASTIC,. So, I can do audio? I’m in! Downloading now. Yep, audio is perfectly acceptable. The majority of readalongs I have participated in have been books in audio format. Glad you can join us! You already know I am in. You couldn’t keep me away even if you tried.